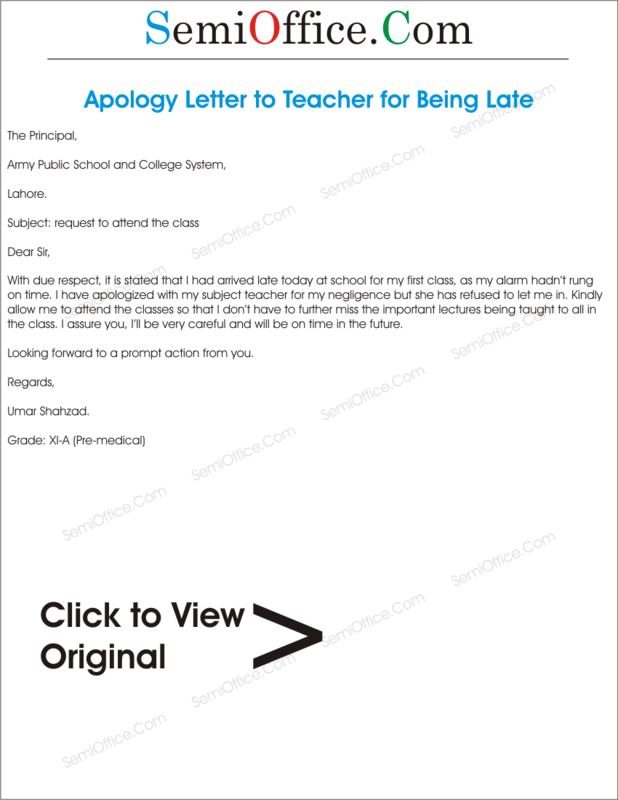 Sample apology letter to teacher by student for coming late to the class. Application for allow me to attend the class when you are reaching late in school, college or university. 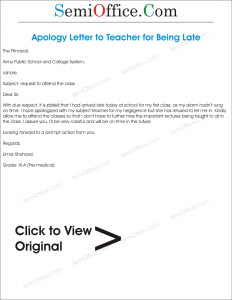 Sample Apology Letter to Teacher for misbehaviour and for talking in class. Yesterday I made a mess during your lecture and in result you ordered me to get out from your class and I miss behaved with you which is obviously unethical. But for the time being anger was on my head. But now I realize that my behavior was really insulting and unethical. For that I am feeling sorry and shame and assure you that I will never repeat this sort of behavior again. Accept my apology and allow me to sit in your class. I will be very thankful to you. With due respect, it is stated that I had arrived late today at school for my first class, as my alarm hadn’t rung on time. I have apologized with my subject teacher for my negligence but she has refused to let me in. Kindly allow me to attend the classes so that I don’t have to further miss the important lectures being taught to all in the class. I assure you, I’ll be very careful and will be on time in the future. Looking forward to a prompt action from you. This letter is to apologize about my conduct in the class with you. I was disturbed from an incident which took place a day earlier but even then I should had not talked to you In the way I did. I admit that it was solely my mistake and I really apologize for my conduct. With due respect it is stated that me (Ali) under registration number accordingly with the official record no L1F14standard6th was absent for last three working days in your institution. I was victim of dengue and was not in a condition to attend the school properly. It was a battle of nerves for me to attend the school with an undefined cause of the fever. My family doctor recommended a complete rest at home. That’s why I felt very ashamed that I missed the school those previous days. Kindly accept the apology on my behalf. I will try my best to remain in contact with the schedule you provided. All in all I apologize the act of not coming to school for illness. Hope I convinced you with the way I brief. I will be grateful to you for the act of kindness in my favor. Write Apology to Headteacher if you missed a lesson, stating reason, how to compensate? Sir, with due respect I have to state that I am Peter Broadway and I am a student of 8th grade. I am writing this letter to apologize for missing a lecture last Friday. I was diagnosed with high fever and severe body ache. I was not in state to attend college so I stayed home as per doctor’s advice. However, I am well again and wish to somehow be able to cover up for the missing lecture if you have time. Thank you for your consideration.